As part of our programmed to reduce the negative impacts of tourism in general, we are offering two special treks into the Makalu-Barun area of Nepal. The treks give the opportunity to visit community conservation sites as well as the opportunity to help support local conservation efforts. The treks feature: environmentally sound camp practices; provide expert leadership knowledgeable about ecotourism and conservation efforts; visits to communities and projects that are working to protect their rich natural environment. 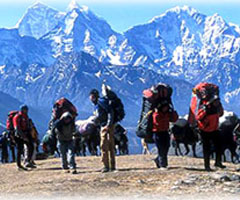 The Salpa-Arun to the Everest area route is one of the three main trekking routes in Makalu-Barun, connecting the Arun River Valley to the Khumbu region. Some 600-800 trekkers follow the lower section of this route each year (1% of total trekkers in Nepal). This trek traverses a wide variety of ecosystems as well as cultural landscapes as it climbs gradually from the mighty Arun River (435m) to Tengboche Monastery (3,800m). From the vantage point beneath picturesque Ama Dablam peak there is a perfectly framed view of Mount Everest, Lhotse and Nuptse, three of the highest mountains in the world. Day 01 Arrive in Kathmandu and settle into hotel. Day 02 Free day in Kathmandu. Hotel. Day 03 Kathmandu to Tumlingtar We take an internal flight to Tumlingtar and prepare for tomorrow. Day 04 Tumlingtar (487m) to Gothebazaar. We follow the Arun River northwards through the sub tropical hardwood forest around Baluwabesi, dotted with Brahmin and Rai villages. Day 05 Gothebazaar to Tala / Upper Phedi. Along the way we see lokta production. We camp near a Sherpa settlement. Day 06 Tala / Upper Phedi to Guranse / Salpa Pokhari. We visit the holy lakes and meet with the local management committee. Day 07 Guranse / Salpa Pokhari to Tue / Sonam. We cross the Salpa La and continue on in a forest of fir and rhododendron. Day 08 Tue / Sonam to Cheskam. We visit the local Rai (the community from which most Gurkha soldiers are chosen) museum and find out about ethnobotany and the locally managed forests. Day 09 Cheskam to Bung / Kiraule. We meet with the local tourism management committee and maybe move on to camp near the lovely Kiraule monastery. Day 10 Bung / Kiraule to Najing. Day 11 Najing to Pangom. We visit the school set up by Hilary and also the hydroelectric facility (MT is involved in a new H.E. project in Phortse). Day 12 Pangom to Chaurikharka. 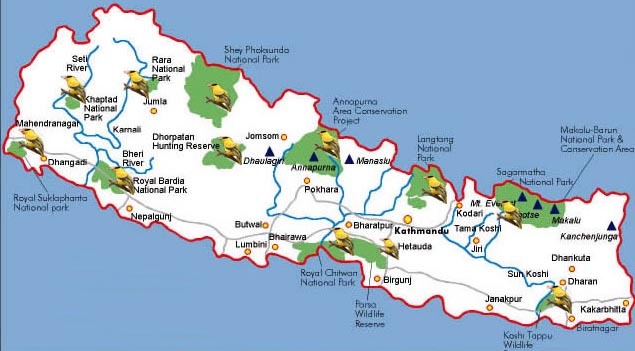 We join the popular Lukla to Everest trekking route and stop along the way to visit a WWF forestry project. Day 13 Chaurikharka. to Namche Bazaar. Day 14 Namche Bazaar. We spend a second night in Namche to help acclimatise to the altitude. Day 15 Namche Bazaar to Kunde / Khumjung. We visit monasteries, another Hilary school and a hospital. Day 16 Kunde / Khumjung to Tengboche. We will visit the famous monastery and along the way maybe see musk deer. Days 17 Tengboche to Tengboche. We take the upper trail to this alpine valley. Day 18 Tengboche to Pheriche (4280m). Today we trek through Pangboche village where what is claimed to be a Yeti scalp is kept in the monastery. Continue on to the highest permanent settlement of the area - Pheriche. Here you will find a medical post and if you arrive in time, go along to the talk held each day at about 15.00 on altitude sickness. Day 19 Pheriche to Lobuche: (4930m). First efforts today are to climb a small ridge and you will find it a real struggle as you continue to further acclimatise. Then contour towards Dugla (4600m) before trekking over the moraine and then alongside the Khumbu Glacier towards Lobuche. Day 20 Lobuche to Kala Patthar (5545m) return to Lobuche (4930m). A day trek with a light load only to Gorak Shep and up Kala Patthar. This is the day you will stand on a hill top adjacent to Everest. WOW !!! Day 21 Lobuche to Dingboche (4350m) and explore the Imja Khola, an intersting valley near to Ama Dablam. Day 22 Dingboche to Tengboche. Day 23 Tengboche to Namche. Day 24 Namche to Lukla. Fly to Kathmandu. Day 25 Kathmandu with free time. Day 26 Depart for home.